We offer our clients a comprehensive array of Game Boxes (B -03) which is beautifully carved by our skilled craftsmen. Their expertise enable us in bringing out the beauty in these boxes, which is appreciated by our clients. Moreover. Our clients can avail these in varied designs and optimum finishes as per their requirements. Item Code:- KE-WG02 Handcrafted Folded Board madeon Wooden Base with inlaid Wooden Round. 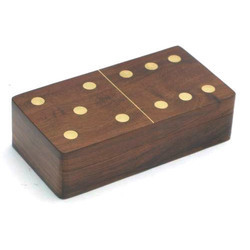 Lovely Handcrafted board for your living room.Its Beautiful Wooden Box Game. This is a very well made wooden version of the popular pen and paper game. The board has been hand crafted with 9 holes to hold the wooden pegs. These Wooden Chess Boxes are made by using very high and durable quality raw material which ensures high durability at its user end. These wooden chess are widely available in various finishes and dimensions. These Wooden Chess Boxes are available at market leading as well as at competitive prices. 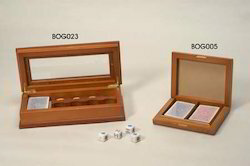 Our company is highly esteemed in offering Tic Tac Toe Wooden Games Box.